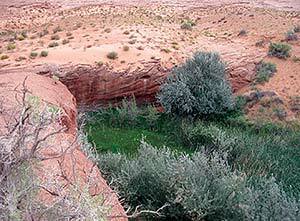 SECOND FROM TOP:This overgrown spot in the Chinle Wash once revealed a stone structure and may be the place three thirsty Spaniards dug for water on their way to California, giving Mexican Water its name. Two other spots also have some oral tradition as the original “Mexican” (actually Spanish) Water, however. Mexican Water Chapter does not have the stunning spires of Monument Valley. It does not have raft put-ins along the San Juan, like Bluff, Utah, or the restaurants and stores of Shiprock, or a nearby national monument like Chinle. It is, however, on the way to all these things. "We're here at a major regional crossroads - (U.S. highways) 191 and 160 - and we haven't really done anything with it," sighed the chapter's manager, Martha Saggboy. There is a trading post there with a restaurant, "but there could be a lot more," Saggboy said. Name - According to local legend, a group of three Mexicans once encamped here on their way to California and dug a shallow well. The location of the well varies depending on whom you ask, either at a seep near the present site of the Baptist church or one of two locations in the Chinle Wash. Problems - maze of jurisdictions, no telephone lines, legacy of cancer in elders who worked in uranium mines to the west and milling facilities to the north. A site where uranium trucks used to transfer ore has been remediated. Before 2012, when the chapter got certified, there wasn't much incentive to develop. But now that the chapter has the ability to impose and use its own taxes ... watch out. This chapter on the convergence of the Walker and Chinle washes is poised for a flash flood of development. The lease on the trading post and restaurant, currently owned by Giant Corp., is about to run out, giving the chapter an entrée for negotiations. Mexican Water should have a seat at the table in the distribution of a $2 million windfall from the San Juan River water rights settlement, and the $40 million Utah Navajo Trust Fund, which could be unfrozen by Congress any time now that the seven Utah Navajo chapters have agreed to use the non-profit Utah Dineh Corp. as a trustee. In the meantime, however, Mexican Water has not been standing still. Drivers on U.S. 191 north of U.S. 160 do a double-take when they spot, in the middle of a featureless plain, a colorful agglomeration of cubes and rounded shapes that is at once thoroughly modern and suggestive of an Anasazi pueblo. It's Multipurpose I, the new chapter house/office space/meeting suite/computer center built in 2011. As its name implies, Multipurpose II and III are on the way. Similar in architecture, they will house veterans' services, a senior center, Head Start, even a nursing home and commercial space. "Our architect calls it 'the jewel of the desert,'" Saggboy said proudly. The complex, which will surround a veterans' memorial in the middle, is on 50 acres withdrawn with the consent of all the grazing permittees - a remarkable feat among Navajo chapters, which are generally hamstrung by grazing rights. "We got the permittees involved in the planning right from the start," Saggboy explained. "They've really taken ownership in the project and been very supportive." Multipurpose I cost just over a million dollars, and the chapter is currently awaiting approval from the Navajo Nation Council for $1.55 million to build Multipurpose II. The money is an amalgam of chapter, tribal capital improvement and Abandoned Mine Land funding. Straddling two states, two police districts, and two power grids, Mexican Water is used to connecting dots. For instance, Saggboy said, the chapter has learned that "our representatives and senators in Arizona think the northern border of Arizona is somewhere around Flagstaff," but Utah is much easier to work with. "We work closely with Governor (Gary) Herbert and our Utah congressmen," she said. "They come down here to visit us a lot." Utah also has a Native American Liaison Committee that actually liaises, according to Saggboy. On the other hand, "San Juan County, Utah, has never declared a disaster," the chapter manager said. "In emergency situations, Arizona is easier to work with." This, unfortunately, sometimes creates division when "the Utah people look over the border to Arizona and say, 'Why are they getting their houses fixed and not us?'" Saggboy said. Amid all the jurisdictions, however, Mexican Water has never gotten a phone company to extend lines into the chapter. It was completely without phone service until 1988, when the chapter rented a radiophone. These days, of course, most people have cell phones, and the Navajo Tribal Utility Authority, or NTUA, is in the process of setting up a 4G network. "The chapter building is completely wireless and could be used as a command center in an emergency," Saggboy said. "Some people say we should just bypass landline and not worry about it, but others say if we want to be a data center, we need redundancy." One thing the chapter certainly needs if it is to develop is three-phase power, and that is in the negotiation stages with NTUA. The chapter is also closely following the proposed exchange of land between the BLM and the Utah School and Institutional Trust Lands Administration for the creation of the Diné Bikéyah National Conservation Area, protecting about a million acres of land traditionally used by Navajos north of the San Juan River - and creating another draw to which Mexican Water is conveniently on the way. But while the jewel of the desert goes up on the heights, some folks down in the Chinle Wash - the site of Mexican Water's original settlers and the original chapter compound - wonder if the chapter's priorities haven't gone a little askew. "When I was young," said one elder, who asked that her name not be used, "I would have been behind everything they want to do - the businesses, the recreation, the new buildings - I would have enjoyed it all. But now I look around, and I see so many people whose houses are falling apart, who don't have running water, and I think, 'Can't we just get everyone to where they're living comfortably?'"